The Red Lodge Legal Services Program (LSP) launched in December 2013! This is a new and innovative pilot project providing greatly needed legal assistance and education to Native American women incarcerated and overrepresented in Coffee Creek Correctional Facility in order to reduce barriers to reentry, improve reentry planning, and empower women to successfully return to the community. 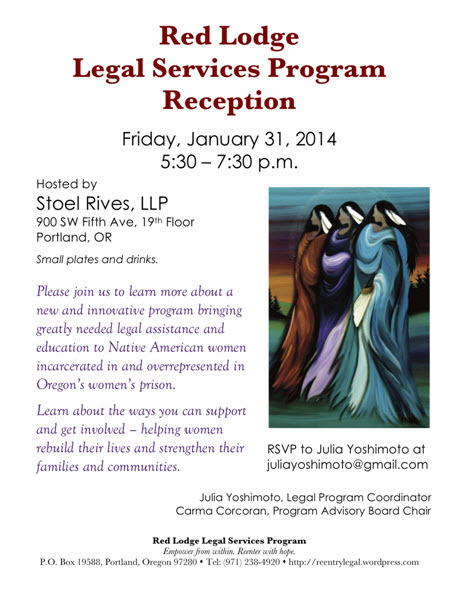 Join us at the reception to learn more about ways you can support and get involved with the Red Lodge Legal Services Program and help women rebuild their lives and strengthen their families and communities! Click here for more information. This entry was posted in Career, Resources and tagged Coffee Creek, incarceration, Julia Yoshimoto, Native American Women, pilot project, Red Lodge Legal Services Program, Stoel Rives by beverlym. Bookmark the permalink.